You took that to a conclusion I didn't expect. Interesting! the (sad) fact of the matter is that 50 dead is not a very big number in the grand scheme of things. Twice as many people died in traffic accidents on the same day. And 2900 babies are murdered every day, something else you don't care about. It is really important not to lose sight of the fact that terrorism grabs the headlines in no small measure because it is rare. 1) lack of control - the victims had little to no control over their deaths. One of the reasons airplane crashes make headlines (and why some people are afraid to fly). 2) unjust killing - the terrorist(s) had no right, and to justification, to kill. The above are not utilitarian reasons. "Rare" is not a factor. The real tragedy IMHO is that neither side of the debate actually makes a principled argument, or acknowledges the simple fact that technology has changed the situation on the ground in ways that demand changes in the law. Physics and economics constrained the carnage in 1791 in ways that it no longer does today. Military weapons are exactly the kind of weapons that the 2nd amendment was intended to protect from the government. I assume you meant semi-automatic above. Now this is where you prior utilitarian rational for ignoring terrorism comes back to bite you. Assault weapons are used in few crimes and comprise a small fraction of the total gun inventory in the United States. By a utilitarian rational, they should be ignored. They only get headlines because the look scary to some people. And therein lies the fundamental problem for gun-rights advocates. The argument that the individual right to bear arms is a line of defense against tyranny is untenable. An assault rifle might slow the jack-booted thugs down a little, but it won't stop them. Revolutionaries have always been weaker than the government they fight against. Yet, sometimes they win. The strategy and tactics specifically avoid frontal assault. The government has tanks and predator drones. You don't, and you never will. If we ever get into a situation where your AK-47 is the only thing standing between us and tyranny, we are screwed. Less screwed, perhaps, than if the people didn't have AK-47s. Freedom is the ability of people to make choices for themselves. Sometimes bad things happen as a result of those choices. That is the price of freedom. Is it worth the cost? That is the argument we should be having. The People haven't bought into your utilitarian ethics. Indeed, the entire national security posture of the United States is not justified using utilitarian ethics. > Assault weapons are used in few crimes and comprise a small fraction of the total gun inventory in the United States. By a utilitarian rational, they should be ignored. They only get headlines because the look scary to some people. RPGs, stinger missiles, tanks, and tactical nukes are also used in few crimes. Does that mean that we should ignore those too? Do you believe that the second amendment protects and individual right to have nuclear weapons? If not, why? Of course it's a baby - see for yourself. Moronic. You should read this. Remember when democrats were pro-life? RPGs, stinger missiles, tanks, and tactical nukes are also used in few crimes. Does that mean that we should ignore those too? Do you believe that the second amendment protects and individual right to have nuclear weapons? The ethical framework adopted for the analysis will determine the answer. Of course, no consensus exists for the proper ethical framework. Let's try a rights-based framework. Postulate: You have the right to self-defense. Given this, the maximum ethical weapon size would be that which allows the weak to kill the strong. The gun as equalizer. A small person could defend themselves against a large person. This enables indivdual agency to determine the use of force for self-defense. Ah, now here we have what gun-grabbers really want to control is not guns, but individual agency. "Controlling guns" just gives them the illusion of controlling people. The NRA has a lot of money and uses it to defeat politicians that seek to erode 2nd Amendment rights. Politicians then conclude that gun control is a political loser. That thing that looks like a person is actually a computer-generated animation. 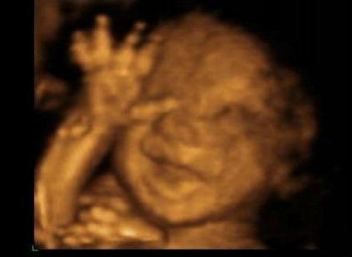 A fetus, like that computer animation, may look like a person. But a fetus, like that computer animation, is not a person. > You should read this. I did. And your point would be...? > Remember when democrats were pro-life? If I read the history books I can remember when they were the home of racist bigotry too, what with Lincoln being a Republican and all. But all that changed when LBJ signed the Civil Rights Act and Nixon welcomed the Klan back into the Republican fold with his Southern Strategy. Again, your point would be...? I'm asking for *your* opinion. > You have the right to self-defense. Against anything? Against the government? I can't help but notice that you didn't answer my question about nukes. 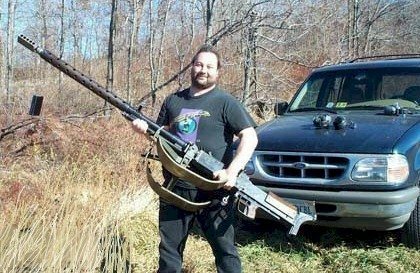 Does the 2nd amendment protect my right to have a nuke so that I can defend myself against government aggression through mutually assured destruction? In the framework I presented, your right to bear arms would include nuclear weapons if they were necessary for your self-defense. Would that be the Civil Rights Act of 1964? The one filibustered by Sen. Robert Byrd* (D-WV)? Which was cut off on June 10, 1964 after an eloquent speech by Senate Minor Leader Everett Dirksen (R-IL) attracted enough Republican support to pass the cloture motion? Where John Williams (R-Del) cast the decisive 67th vote for cloture? The final bill in which 82% of Republicans voted "yea" for? * Sen. Robert Byrd (D-WV) was Hillary Clinton's mentor and friend. As a young man, he recruited 150 young men to create a new chapter of the Ku Klux Klan in Sophia, West Virginia; he was unanimously elected to Exalted Cyclops to lead this Klan chapter. Nixon welcomed the Klan back into the Republican fold with his Southern Strategy. Ah, the mythical Southern Strategy. Nixon himself denied its existence. You also make the mistake of thinking the Republican Party is monolithic.